The members of the NPDUIS Advisory Committee, for their expert oversight and guidance in the preparation of this report. Dr. Steven Morgan, University of British Columbia, for his expert review of the methodology and analytic content of the report. NPDUIS operates independently of the regulatory activities of the Board of the PMPRB. The research priorities, data, statements and opinions expressed or reflected in NPDUIS reports do not represent the position of the PMPRB with respect to any regulatory matter. NPDUIS reports do not contain information that is confidential or privileged under sections 87 and 88 of the Patent Act, and the mention of a drug in a NPDUIS report is not and should not be understood as an admission or denial that the drug is subject to filings under sections 80, 81 or 82 of the Patent Act or that its price is or is not excessive under section 85 of the Patent Act. Although based in part on data provided by the Canadian Institute for Health Information (CIHI) and under license from the QuintilesIMS Payer Insights Database, the statements, findings, conclusions, views and opinions expressed in this report are exclusively those of the PMPRB and are not attributable to CIHI, or QuintilesIMS. Each publicly funded drug plan in Canada provides coverage to its eligible population based on a unique plan design, list of approved drugs (formulary) and reimbursed costs. This three-part PMPRB series analyzes the gaps and overlaps among the provincial and federal public drug listings. The information contained in these reports will inform the dialogue on improving the affordability and accessibility of necessary prescription drugs, including exploring the need for a national formulary. This first report in the series provides insight into the degree of alignment among the formularies. Based on 2015 data, this analysis compares the overall drug listings and unpacks specific market segments including single- and multi-source drugs, high-cost drugs, and a specified list of essential medicines. Parts 2 and 3 of the series will focus specifically on newer drugs assessed through the Common Drug Review (CDR) process and oncology drugs assessed through the pan-Canadian Oncology Drug Review (pCODR) process, respectively. Formulary lists include thousands of pharmaceutical drugs, as well as other related health products. For this analysis, all brand-name and generic products containing the same active ingredient were grouped together and considered to be a single drug, irrespective of the strength, formulation or manufacturer. There were 1,456 drugs, grouped at the active ingredient level, listed on at least one of the provincial formularies or on the formulary of Health Canada’s Non-Insured Health Benefits (NIHB) Program in December 2015. Of these, 729 drugs, accounting for 82% of the total drug costs in 2015Footnote 1, were selected for analysis. To improve the consistency of comparisons among the formularies, drug categories covered under specialized programs, over-the-counter drugs, and drugs without utilization data in 2015 were excluded from the sample analyzed. A link to the complete list of drugs selected for analysis is available on the Analytical Studies page of the PMPRB website (see the Formularies in Canada listing under Report Series). There is a reasonably high degree of alignment among public drug plan formularies in Canada. Individual public plans listed an average of 79% of the 729 selected drugs in 2015. The average formulary listing rate increased to 95% when relative drug costs were factored in, suggesting that drugs not covered by the plans only accounted for a small share of costs. When each pair of formularies was compared, there was an average bilateral rate of agreement of 82% across plans; this increased to 93% when drug costs were considered. Alignment among public plans is greatest for multi-source drug listings, which generally have a higher use and lower cost. Public plans listed an average of 86% of the 467 multi-source drugs selected for analysis, accounting for a striking 97% of the respective costs. Listing rates for multi-source drugs were only moderately variable, ranging from 78% to 92% depending on the plan. Public drug plans generally listed multi-source drugs without restrictions, although for approximately one-third of these drugs the decision to list with or without restrictions was not completely unanimous among plans. Public plans are less well aligned in their listing decisions for single-source drugs, with more variability for high-cost drugs. Public plans listed an average of 67% of the 262 single-source drugs selected for analysis, accounting for 93% of the respective costs. Listing rates for single-source drugs varied widely across plans, ranging from 51% to 80%, and the range was even greater for those with high costs, 37% to 90%. Public drug plans generally listed single-source drugs, especially those with high costs, as restricted benefits, although for 36% of these drugs the decision to list individual drugs with or without restrictions was not completely unanimous across plans. Almost all of the drugs on the CLEANFootnote 2 list of essential medicines are listed on the public drug plan formularies, and the majority are listed without restrictions. Public plans listed an average of 92% of the 125 essential medicines, accounting for an overwhelming 98% of the respective costs. Listing rates for essential medicines varied from 85% to 97% depending on the plan. Since many essential medicines are multi-source drugs, they were generally listed without restrictions, although for approximately one quarter of the drugs the decision to list individual drugs with or without restrictions was not completely unanimous across plans. Note that the listing rates across public plans may be influenced by differences in plan designs, demographics and the disease profiles of the eligible beneficiary populations. The main data sources for this report were the National Prescription Drug Utilization Information System (NPDUIS) database at the Canadian Institute for Health Information (CIHI) and the List of Medications published by the Régie de l'assurance maladie du Québec (RAMQ). Agreement rate: the percentage of agreement between drug listing decisions for any two formularies; plans were considered to be in agreement if they made the same listing decision for a particular drug: to list or not to list. Drug: includes all strengths and formulations of a specific active substance; in this report drugs are defined at the ATC level 5 as reported by CIHI and encompass all brand-name and generic products containing the same active ingredient. Drug plan design: each public drug plan has its own unique set of programs, eligibility criteria and cost-sharing structures collectively referred to as its plan design. For an overview of the NPDUIS public drug plans, see the Public Drug Plan Designs reference document on the NPDUIS Analytical Studies page of the PMPRB website. Essential medicines: defined by the World Health Organization (WHO) as “medicines that satisfy the priority health care needs of the population”; this analysis considers a list of 125 essential medicines identified by the CLEAN Meds ProjectFootnote 3 for primary care in Canada as of 2016. Formulary: a list of drugs covered as benefits for eligible beneficiaries; each drug plan determines its own list of approved drugs. High-cost drug: a drug with an average annual treatment cost per patient exceeding $10,000. Listing rate: the percentage of selected drugs listed on a formulary compared to the total number of drugs selected for analysis (729 in total). Multi-source drug: a drug that is manufactured by two or more companies; this includes the original brand-name drug and/or its generic equivalent(s). NPDUIS public drug plans: Canadian public drug plans participating in the National Prescription Drug Utilization Information System (NPDUIS) initiative; this includes all provincial plans (except for Quebec) as well as Health Canada’s Non-Insured Health Benefits drug plan. Single-source drug: a drug that is manufactured by only one company; in this report, this is restricted to brand-name drugs with no available generic versions. Specialized programs: public drug plans may have separate programs for well-defined groups of patients such as cancer care, HIV, rare diseases etc. Drugs used to treat these conditions may or may not be listed on the drug plan formulary depending on the jurisdiction. Restricted benefit: a drug that is restricted to specific criteria, for example, to a specific indication. In this analysis, a drug is considered to be a restricted benefit if all available versions (strength, form, manufacturer) listed on a formulary have a restricted benefit status. Unrestricted benefit: a drug that has no restriction criteria. In this analysis, a drug is considered to be an unrestricted benefit if at least one version (e.g., strength, form, and/or manufacturer) listed on a formulary is categorized as unrestricted. Weighted listing rate: calculated as the sum of the listing rates for each drug multiplied by its corresponding share of the total drug cost for the NPDUIS public drug plans. Canadians spent $29.4 billion on prescription drugs in 2014: $12.5 billion, or 42.6%, was financed by the public sector; while $16.9 billion, or 57.4%, was paid by the private sector through insurers or by individuals (Canadian Institute for Health Information, 2016). In Canada, public plans cover prescription drug costs for approximately 29% of the population (National Health Coalition 2016) including seniors, lower-income earners or those with high drug costs in relation to their income. Each of the 10 provinces and 3 territories provides coverage to their eligible residents. In addition, federal plans cover Veterans, First Nations and Inuit, the Royal Canadian Mounted Police and the military. Prescription drug costs in Canada are covered by a blend of public, private and out-of-pocket payers. Although there are similarities among the publicly funded plans, each is unique, with its own specific plan design, list of approved drugs, or formulary, and reimbursed costs. Since 2010, the pan-Canadian Pharmaceutical Alliance (pCPA) has been working to achieve greater value for brand-name and generic drugs for all publicly funded drug programs. This has resulted in a better jurisdictional alignment in terms of reimbursed drug prices; however, there are still differences among the plan designs and formularies. In response to the variation in drug plan coverage and the increasing costs of new drugs, the call for a national pharmacare program in Canada has been growing. To inform this dialogue, the Patented Medicine Prices Review Board through the National Prescription Drug Utilization Information System (NPDUIS) has developed a three-part report series that explores the current gaps and overlaps in Canadian public drug plan formularies. This first report in the series provides insight into the degree of alignment among the formularies. Based on 2015 data, it compares the overall drug listings and unpacks specific market segments including single- and multi-source drugs, high-cost drugs, and a specified list of essential medicines. Parts 2 and 3 of the series will focus on newer drugs assessed through the Common Drug Review (CDR) process and oncology drugs assessed through the pan-Canadian Oncology Drug Review (pCODR) process, respectively. Formulary lists include thousands of pharmaceutical drugs, as well as other related health products, identified by their active ingredient, manufacturer, product name, strength, form and route of administration. The drugs analyzed in this study are grouped by active ingredient at the ATC level 5 as reported by CIHI. Of the 1,456 drugs listed on the Canadian public formularies in 2015, 729 were selected for analysis, including 262 single-source brand-name products and 467 multi-source products. The selected drugs were listed on at least 1 of the 11 Canadian public drug formularies with data available as of December 31, 2015: British Columbia, Alberta, Saskatchewan, Manitoba, Ontario, Quebec, New Brunswick, Nova Scotia, Prince Edward Island, Newfoundland and Labrador, and Health Canada’s Non-Insured Health Benefits (NIHB) Program. The complete list of drugs included in the analysis is available on the Analytical Studies page of the PMPRB website (see the Formularies in Canada listing under Report Series). Drugs with limited available data, such as those covered under specialized programs, were excluded from the analysis to ensure a consistent comparison across jurisdictions. These included age-related macular degeneration drugs, cancer drugs, diagnostic agents, HIV drugs, epoetins and selected drugs for rare diseases. Over-the-counter drugs and drugs without utilization data or with other data limitations were also excluded. Some of these drugs will be covered in Parts 2 and 3 of the series, which will focus on newer drugs assessed through the CDR process and oncology drugs assessed through the pCODR process, respectively. See Appendix A for more detailed information on drug exclusions. The main data sources for the formulary listsFootnote 4 are the National Prescription Drug Utilization Information System (NPDUIS) database, developed by the Canadian Institute for Health Information (CIHI), and the List of Medications published by the Régie de l'assurance maladie du Québec (RAMQ). Drug cost information for the individual plans is based on the 2015 NPDUIS CIHI database, which captures all of the public plans except for Quebec. Results reported in Appendix C are based on national sales data from QuintilesIMS Payer Insights Database for 2015 and include all sales in the public, private and out-of-pocket market segments. Canadian public drug plans participating in the NPDUIS initiative include all provincial plans (except for Quebec) as well as the NIHB. The 729 drugs selected for this analysis accounted for $6.6 billion or 82% of the total $8.0 billion in NPDUIS drug costs for the 2015 calendar year. Single-source drugs refer to brand-name drugs produced by one manufacturer without generic versions available on the market. High-cost drugs are an important subset of single-source drugs and are defined as products with an average annual drug cost per active beneficiary exceeding $10,000. A preliminary list of 80 high-cost drugs reimbursed by the NPDUIS public drug plans in 2015 was identified. Of these 80 drugs, 41 met the selection criteria previously described and were included in the analysis. The remaining drugs were excluded from this analysis because they were covered by specialized programs, such as oral cancer treatments, which will be analyzed in Part 3 of the series. Multi-source drugs are produced by two or more manufacturers, and include the original brand-name drug and/or its generic equivalent(s). The list of essential medicinesFootnote 5 in this report consists of 125 single- and multi-source drugs based on the CLEAN Meds Project list of essential medicines for primary health care in CanadaFootnote 6. The specific drugs used for this study are listed in Appendix D along with the corresponding drug expenditure in the public plans and national sales. The listing rates in terms of drugs were calculated by dividing the number of drugs listed in the respective formulary by the total number of drugs selected for analysis (729). The listing rates in terms of drug costs were calculated based on each drug’s relative share of the total NPDUIS public drug plan cost for the 729 selected drugs in 2015. Weighting was based on the total for all public drug plans analyzed to reduce any bias stemming from individual weighting by jurisdiction. The results for the top 20 therapeutic classes defined at ATC level 2 were also measured. The restricted and unrestricted formulary benefit status is also analyzed in this report based on information available in the NPDUIS database. A drug was considered to have an unrestricted benefit status in a given plan if at least one version was categorized as unrestricted. If all available versions in a plan were restricted, it was categorized under the restricted benefit status. Restricted benefit status encompasses the special authority in British Columbia; restricted benefit and special authorization in Alberta; Parts 2 or 3 in Manitoba; exceptional drug status in Saskatchewan; limited use or exceptional access program in Ontario; exceptional medications in Quebec; special authorization in New Brunswick; exceptional status in Nova Scotia; special authorization in Prince Edward Island; special authorization in Newfoundland and Labrador; and limited use in the NIHB. In addition, each plan may have other clinical criteria under which a drug will be funded. Agreement rates measuring the degree of alignment for listing decisions between each pair of public drug plans are also reported for the 729 selected drugs. In total, 55 jurisdictional combinations were compared in terms of the number of drugs and the corresponding drug costs. The plans were considered to be in agreement if both plans had the same listing decision: either to list (yes-yes) or not to list (no-no) a drug. Simple averages and ranges are reported for the pairs of plans. 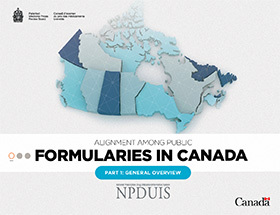 The purpose of this report to assess the general overlap and gap in formulary listings across the public drug plans in Canada, and it is not intended to evaluate the extent to which drugs approved in Canada are, or are not, listed in the public formularies. While the drugs analyzed in this report account for a large portion of the drugs reimbursed by the public plans and their related costs, they do not represent a complete picture of public reimbursement. Certain drugs may be covered through the formulary in some provinces, while in others they may be covered through specialized programs that are not typically reported in the NPDUIS databaseFootnote 7. As a result, important therapeutic classes of drugs, such as age-related macular degeneration drugs, oncology productsFootnote 8, HIV medications and some drugs for rare diseases, were excluded from this analysis. They will be covered in Parts 2 and 3 of the series. The report provides a snapshot of formulary coverage based on the 2015 calendar year and does not include any drugs that may have been subsequently listed on the formularies. A simple analysis of the number of drugs listed poses certain limitations when comparing formulary listings. The number of drugs listed can depend on the therapeutic needs of the eligible population as well as decisions related to the listing, for example, choosing the most cost-effective drugs in therapeutic categories that have multiple treatment options. The variation in listing rates across public plans may be influenced by differences in the plan designs, demographics and disease profiles of the eligible beneficiary populations. For example, public drug plans in British Columbia, Saskatchewan and Manitoba, which have universal income-based coverage, may list drugs that respond to the therapeutic needs of a more general population; other provincial public drug plans may offer a list tailored toward the populations in their specific programs. The NIHB provides universal drug coverage to the First Nations and Inuit population, which has a distinct demographic and disease profile. There are also jurisdictional variations in the definition of restricted versus unrestricted drug benefits. While most plans define unrestricted status in the same way, there are various definitions for restricted benefits, and differences in the clinical criteria under which the drug will be funded (see Appendix B). The weighted formulary listing rates are based on the overall drug costs in the NPDUIS public drug plans analyzed. These rates may be influenced by the cost of drugs available in the majority of plans or by the cost in larger plans. This means that drugs not commonly reimbursed, or reimbursed by smaller plans, may have lower related costs, and hence, lower weights in the overall results. Furthermore, public drug plan data for Quebec is not available in the NPDUIS database, and thus, the importance of the costs in Quebec is not reflected in the weighted results. To test the extent to which these limitations impact the results, national sales data (including public, private and out-of-pocket payers) was also used for weighting purposes (see Appendix C). While the listing rates decreased slightly when national sales weights were applied, the results are comparable and do not impact the overall findings of the study. The gap in formulary listing among plans and the corresponding share of costs should not be interpreted as the dollar impact if the listings were aligned. If all plans listed a drug currently covered by only some of the jurisdictions (i) the cost-weighting would shift, as more costs would be attributed to the particular drug; and (ii) the cost may not be a complete add on, but rather a shift from one drug to another, as some plans may have therapeutic alternatives already listed. These elements have not been assessed in this analysis. There is a reasonably high degree of alignment among individual public drug plan formularies in Canada, which list a large proportion of the total drugs covered by public plans. When the related drug costs are factored in, the formulary listing rates are even higher, suggesting that drugs not covered by the plans only account for a small share of costs. A direct comparison of listing decisions between pairs of plans reinforces this result‒demonstrating that while variations exist, overall there is a general consensus among plans. Most of the 729 drugs selected for this analysisFootnote 9 were listed on the individual public drug plan formularies in 2015. Listing rates were relatively high, ranging from 70% in Prince Edward Island to 86% in Quebec, with an average of 79% across all of the plans analyzed. When the drugs were weighted by cost, the listing rates were even higher and more uniform across jurisdictions, ranging from 87% in Prince Edward Island to 98% in several public plans, with an average of 95%. Given the high cost concentration generally observed in the pharmaceutical market, a small number of drugs account for a large share of the costs; this explains the increased level of listing agreement when drug costs are factored in. Figure 1.1 reports the formulary listing rates by public drug plan for the number of drugs as well as their corresponding share of costs in the NPDUIS public drug plans in 2015. For example, in 2015, British Columbia listed 585 or 80% of the 729 drugs, representing $1,235 million in drug costs. When these 585 drugs were assigned a weight or importance based on their costs in all public plans analyzed (except Quebec), British Columbia’s listing rate increased to 90%. This bar graph gives the listing rates and cost-weighted listing rates for each public plan analyzed. The accompanying table gives the absolute number of selected drugs listed on each formulary as well as the drug costs for the listed drugs. In total, the 729 drugs selected for the study represented $6,555 million in NPDUIS public drug costs in 2015. Note: Listing rates were based on the total number of drugs selected for the study (729). *Drugs listed in at least one public formulary, subject to exclusion criteria. †Drug costs are amounts accepted for reimbursement by the public drug plans for the respective drugs analyzed. Data Source: National Prescription Drug Utilization Information System Database, Canadian Institute for Health Information; List of Medications, Régie de l'assurance maladie du Québec, Nov. 20, 2015. Each of the plans was further assessed to determine the percentage of selected drugs listed on their formularies that were categorized as unrestricted versus restricted benefits. The results suggest that a relatively high percentage of the selected drugs had no restrictions, 74% on average across the plans. However, the overall result masks important variations depending on the market segment analyzed; this will be discussed in more detail in the following sections. Figure 1.2 provides a breakdown by benefit status in terms of (a) listed drugs and (b) their respective costs for each of the public plans. The NIHB listed 83% of the drugs without restrictions, a considerably higher proportion than the other public drug plans. Ontario and Saskatchewan had the lowest rate, listing approximately two-thirds of the drugs without restrictions. All the other plans were within the 72% to 78% range. While, on average, only 26% of the drugs were listed with restrictions, they accounted for over 40% of the corresponding drug costs in public drug plans. This indicates that the restricted status generally applied to drugs with higher costs, which is further supported by the findings in Section 3. The overall results demonstrate that of the 729 selected drugs, 49% had an unrestricted benefit status in all the formularies in which they were listed, accounting for 30% of overall costs in the NPDUIS public plans; 16% were listed with restrictions in all plans, accounting for 29% of the costs; and 35% had a mixture of unrestricted and restricted benefits depending on the plan and accounted for 41% of the total costs. This graph consists of two parts; each part has a bar graph and a single row table with additional information. Part A gives the percent share of the selected drugs listed as restricted and unrestricted benefits for each public drug plan. Part B gives the share of costs for the restricted and unrestricted drugs listed. Overall results for all public plans are given for both parts. In total, the 729 drugs selected for the study represented $6,555 million in costs in 2015. Overall results demonstrate that 49% of the selected drugs were listed as unrestricted benefits in all the formularies in which they were listed; 16% were listed as restricted benefits; and 35% were listed as a combination of unrestricted and restricted benefits depending on the plan. Overall results for the drug costs indicate that 30% of the selected drugs were listed as unrestricted benefits in all the formularies in which they were listed; 29% were listed as restricted benefits; and 41% were listed as a combination of unrestricted and restricted benefits depending on the plan. Note: Based on the total number of drugs (729) selected for the study. †Drug costs are amounts accepted for reimbursement by the public drug plans for the respective drugs analyzed. Data for Quebec is not available in the NPDUIS database. An analysis of the overall public drug plan coverage revealed that most (82%) of the 729 selected drugs were listed in 6 or more of the 11 public formularies studied: 48% were listed in all of the formularies, while 34% were listed in 6 to 10 formularies (Figure 1.3). The drugs listed in 6 or more public drug plans accounted for 98% of the costs of the selected drugs. A small proportion of the drugs (18%) were listed in less than 6 plans. These drugs accounted for a significantly lower proportion of the total drug costs at only 2%. These two doughnut graphs give the percentage of the 729 selected drugs listed in (1) all public plans analyzed, (2) six to ten plans, and (3) less than six plans. The first graph gives the percentage by the number of drugs and the second give the corresponding share by drug costs. Note: Based on the total number of drugs (729) selected for the study. All provincial public drug plans and the Non-Insured Health Benefits (NIHB) program were included in the analysis. The listing rates reported in Figure 1.1 compare each of the individual formularies to the total number of selected drugs. To obtain insight into the extent to which the listing decisions align across plans, agreement rates were also measured. These rates were calculated for each pair of plans, and considered their listing decisions for each of the 729 selected drugs. For the 11 plans analyzed, 55 bilateral comparisons were considered, with the yes-yes and no-no formulary listing decisions being considered as an “agreement”Footnote 10. Table 1.1 provides the ranges for the bilateral agreement rates across all plans analyzed, both in terms of the number of drugs (unweighted) as well as the corresponding costs in the NPDUIS public drug plans (weighted). In terms of the number of drugs, the agreement rates ranged from 75% (between Quebec and Prince Edward Island) to 89% (between Nova Scotia and New Brunswick), with an average and median rate of agreement of 82%. When the cost of the drugs was taken into account, the average agreement rates increased markedly, ranging from 81% (between British Columbia and Prince Edward Island) to 98% (between several pairs of plans), with average and median rates of agreement of 93% and 95%, respectively. These results again suggest that the drugs that are not consistently listed across the plans only account for a small share of the costs. Note: Agreement rates were based on 55 bilateral combinations for the 11 public drug plans analyzed: all provincial public plans and the Non-Insured Health Benefits (NIHB) program. The level of alignment between public plans can be further explored by considering the average listing rates at the therapeutic class level. Figure 1.4 depicts the top 20 therapeutic classes in terms of cost in 2015, which accounted for 86% of the total cost of the selected drugs in the NPDUIS public drug plans. The analysis found that the average percentage of listed drugs was relatively high for most of the top therapeutic classes, with some important variations in the ranges. The listing rate for each plan was calculated separately by therapeutic class, and the average was then determined across all plans. Almost one third of the top therapeutic classes had average listing rates of 90% and higher, including antivirals for systemic use, agents acting on the renin-angiotensin system, psycholeptics, and lipid modifying agents. While the latter three were generally composed of multi-source drugs, the antivirals for systemic use class included the effective, but higher-cost hepatitis C drugs. Even though the average listing rate for this class was very high (92%), there were important variations in the rates across plans, ranging from 53% to 100%. This may be due, in part, to the decisions of some plans to list select medications, rather than all available treatments, based on their affordability or cost effectiveness. Drug listing rates increased when the drug costs were considered, but there was only a slight change for many classes. The listing rates for the immunosuppressants and drugs used in diabetes classes were the exceptions, with significantly higher rates when weighted by cost. This graph gives the range of formulary listing rates for the selected drugs by therapeutic class across all plans. The minimum, maximum and average listing rates are given for each class as well as the average cost-weighted rate. Note: Listing rates were calculated based on the total number of drugs (729) selected for the study at the ATC level 2. 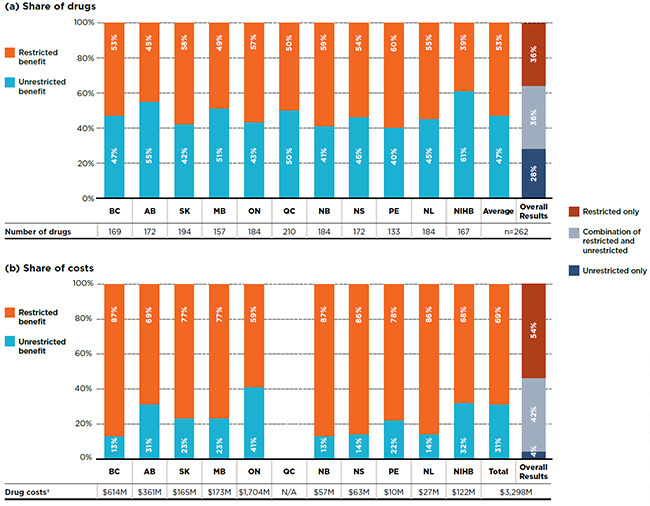 While overall formulary listing rates are relatively high and comparable across the public plans, the results differ for the two main market segments, with lower and more variable rates for single-source drugs and higher and more uniform rates for multi-source drugs. Nevertheless, when drug costs are considered, the formulary listing rates are relatively high for both market segments. Of the 729 drugs selected for analysis, 262 were single-source and 467 were multi-source drugsFootnote 11. These two market segments each accounted for a $3.3 billion in public plan drug costs in 2015. While individual provinces listed an average of 67% of the single-source drugs, the listing rates for multi-source drugs were considerably higher, 86% on average. 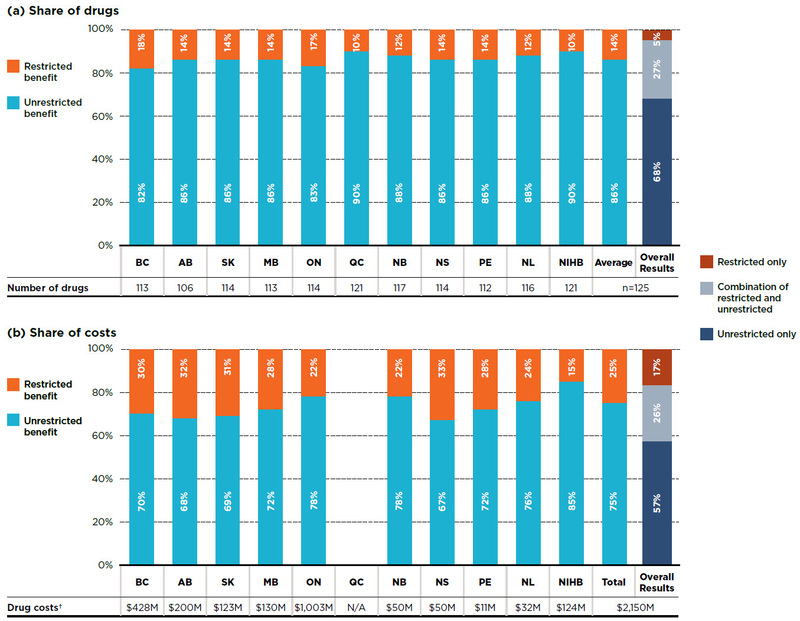 As shown in Figure 2.1, the listing rates for single-source drugs varied, ranging from 51% in Prince Edward Island to 80% in Quebec. When drug costs are considered, the listing rates were significantly higher in all public drug plans, averaging 93% across plans and reaching 99% in Ontario. These findings suggest that drugs not covered by the plans only account for a small share of costs. 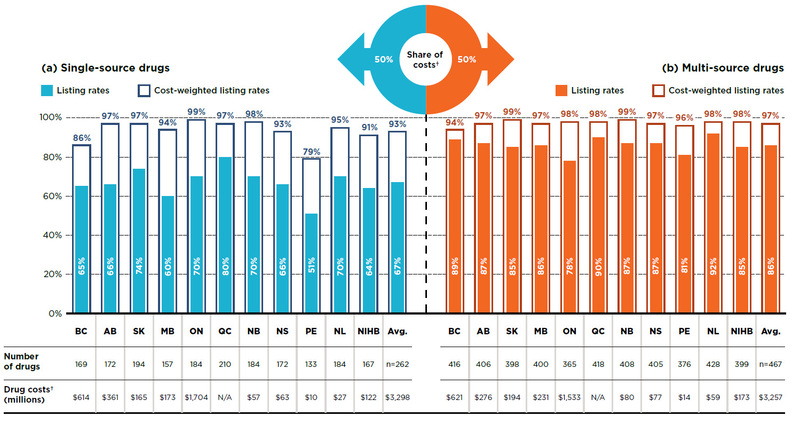 The listing rates for multi-source drugs were higher and more uniform, ranging from 78% in Ontario to 92% in Newfoundland and Labrador. When weighted by drug cost, the listing rates increased, averaging 97% across plans and reaching over 94% in all public drug plans. This two-part bar graph illustrates the listing rates and cost-weighted listing rates for the single-source and multi-source drugs analyzed. The accompanying tables give the absolute number of selected drugs and the drug costs for the listed drugs. Of the total 729 drugs selected for the study, 262 were single-source drugs, representing $3,298 million in NPDUIS public drug costs in 2015 and 467 were multi-source drugs, representing $3,257 million in costs. Note: Listing rates were based on the number of drugs selected for the study (467 multi-source and 262 single-source drugs). An analysis of the benefit status demonstrates that, on average, over half of the single-source drugs listed on any particular public formulary were listed with restrictions. In contrast, most of the multi-source drugs had no restrictions, indicating that the public drug plans placed more conditions on the newer, more costly drugs. Figure 2.2 focuses on single-source drugs and provides a breakdown by benefit status in terms of (a) listed drugs and (b) their respective costs for each of the public plans. On average, 53% of the drugs listed on a particular plan were listed with restrictions, accounting for over two-thirds (69%) of the public plan costs related to single-source drugs. The overall results (right-hand bar in Fig. 2.2) demonstrate that of the 262 single-source drugs, over one third (36%) had a restricted benefit status in all the formularies in which they were listed, accounting for 54% of the overall costs in the NPDUIS public plans; another 36% of the drugs had a mixture of unrestricted and restricted benefits depending on the plan and accounted for 42% of the total costs. The remaining 28% of the drugs were listed without restrictions, and only accounted for a minimal 4% share of costs. This graph consists of two parts; each has a bar graph and a single row table with additional information. Part A gives the percent share of single-source drugs classified as restricted and unrestricted benefits in each plan. Part B gives the share of costs for the restricted and unrestricted drugs listed. Overall results for all public plans are given for both parts. Of the total 729 drugs selected for the study, 262 were single-source drugs, representing $3,298 million in NPDUIS public drug costs in 2015. Overall results indicate that 28% of the single-source drugs were listed as unrestricted benefits in all the formularies in which they were listed; 36% were listed as restricted benefits; and 36% were listed as a combination of unrestricted and restricted benefits depending on the plan. Overall results for the drug costs indicate that 4% of the single-source drugs were listed as unrestricted benefits in all the formularies in which they were listed; 54% were listed as restricted benefits; and 42% were listed as a combination of unrestricted and restricted benefits depending on the plan. Note: Based on the total number of single-source drugs (262) selected for the study. In contrast to single-source drugs, multi-source drugs were generally listed as unrestricted benefits, with an average of 85% of the drugs listed without restrictions. Figure 2.3 provides a breakdown by benefit status for multi-source drugs in terms of (a) listed drugs and (b) their respective costs for each of the public plans. The overall results demonstrate that of the 467 multi-source drugs, 61% had an unrestricted benefit status in all the formularies in which they were listed; 34% of the drugs had a mixture of unrestricted and restricted benefits depending on the plan; and 5% were listed with restrictions. A similar distribution was found when the drug costs were considered. This graph consists of two parts; each part has a bar graph and a single row table with additional information. Part A gives the percent share of multi-source drugs classified as restricted and unrestricted benefits in each public plan. Part B gives the share of costs for the restricted and unrestricted drugs listed. Overall results for all public plans are given for both parts. Of the total 729 drugs selected for the study, 467 were multi-source drugs, representing $3,257 million in costs. Overall results indicate that 61% of the multi-source drugs were listed as unrestricted benefits in all the formularies in which they were listed; 5% were listed as restricted benefits; and 34% were listed as a combination of unrestricted and restricted benefits depending on the plan. Overall results for the drug costs indicate that 57% of the multi-source drugs were listed as unrestricted benefits in all the formularies in which they were listed; 3% were listed as restricted benefits; and 40% were listed as a combination of unrestricted and restricted benefits depending on the plan. Note: Based on the total number of multi-source drugs (467) selected for the study. A comparison of listing decisions across multiple plans shows that two-thirds of selected single-source drugs were listed in 6 or more of the 11 public drug plan formularies, while a noticeably higher percentage of the multi-source drugs (88%) were covered by 6 or more plans. When costs were considered, an even larger percentage of both single- and multi-source drugs were reimbursed by the majority of plans (97% and 99%, respectively). The extent to which listing decisions align between pairs of plans was also measured for single- and multi-source drugs. Table 2.1 provides the ranges for the bilateral agreement rates across all plans analyzed, both in terms of the number of drugs (unweighted), as well as the corresponding costs in the NPDUIS public drug plans (weighted). The results suggest that the agreement rates were higher and more uniform for multi-source drugs. High-cost drugs are an important subset of the single-source market segment. Of the 262 single-source drugs selected for analysis, 41 were identified as high-costFootnote 12, having an average annual drug cost per beneficiary exceeding $10,000. In 2015, these drugs accounted for a sizeable share of the public drug plan costs, reaching $1.5 billion. While the listing rates for high-cost drugs varied widely across the plans, from 37% to 90%, the average listing rate was the same as single-source drugs in general (67%). 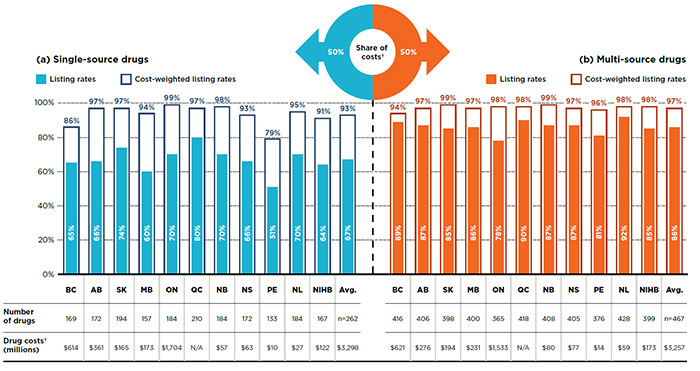 When drug costs were factored in, the listing rates were higher and more uniform, with all plans having rates of 90% or greater except PEI (65%) and the NIHB (83%). Almost all (96%) of the high-cost drugs were listed with restrictions. Like other single-source drugs, over two-thirds (71%) of the selected high-cost drugs were listed in 6 or more of the 11 public drug plan formularies, accounting for 96% of the respective drug costs. However, the bilateral agreement rates were generally lower than for single-source drugs in general, with average and median rates of agreement of 60% and 63%, respectively. When the cost of the drugs was taken into account, the average and median rates of agreement increased substantially to 89% and 94%. Almost all essential medicines are listed on public drug plan formularies and the listing rates are consistent across plans. The majority of these drugs are available as unrestricted benefits, with very little variation across the formularies. A comparison of listing decisions between pairs of plans demonstrates a high degree of agreement. This section assesses the interjurisdictional alignment of essential medicines. The list of 125 drugs used for this analysis was based on the CLEAN Meds Project list of essential medicines for primary health care in Canada and includes both single- and multi-source drugs (16 and 109 drugs, respectively). Two of the single-source drugs are high-cost drugs, as defined previously (adalimumab and emtricitabine/tenofovir disoproxil/efavirenz). See Appendix D for a full list of the essential medicines analyzed along with their public drug plan costs and national sales for 2015. This market segment accounted for $2.2 billion in public plan drug costs in 2015. Almost all of the essential medicines were listed on the public drug plan formularies. As shown in Figure 3.1, individual formulary listing rates ranged from 85% in Alberta to 97% in Quebec and the NIHB, with an average of 92% across all of the plans analyzed in 2015. When drug costs were considered, the listing rates reached almost 100% in all of the formularies. This bar graph gives the listing rates and cost-weighted listing rates for the list of essential medicines analyzed. The accompanying table gives the absolute number of essential medicines listed on each formulary as well as the drug costs for the listed drugs. In total, the 125 essential medicines were selected for the study representing $2,150 million in NPDUIS public drug costs in 2015. Note: Listing rates were based on the total number of essential medicines (125). * The selection of drugs was based on the CLEAN Meds Project list of essential medicines for primary health care in Canada as of 2016. An analysis of the benefit status indicates that, on average, 86% of the essential medicines listed in a particular plan were listed without restrictions. Although only 14% of the drugs were listed with restrictions, they accounted for 25% of the drug costs in public plans. Figure 3.2 provides a breakdown by benefit status in terms of (a) listed drugs and (b) their respective costs for each of the public plans. The NIHB and Quebec listed 90% of the drugs without restrictions, an average that is slightly higher than in other public drug plans, which ranged from 82% to 88%. The overall results demonstrate that of the 125 essential medicines, 68% of the drugs had an unrestricted benefit status in all formularies in which they were listed, accounting for 57% of overall costs in the NPDUIS public plans; 27% had a mixture of unrestricted and restricted benefits depending on the plan and accounted for 26% of the total costs; and 5% had were listed with restrictions in all plans, accounting for 17% of the costs. This graph consists of two parts; each part has a bar graph and a single row table with additional information. Part A gives the percent share of essential medicines classified as restricted and unrestricted benefits by public plan. Part B gives the share of costs for the restricted and unrestricted drugs listed. Overall results for all public plans are given for both parts. Overall results indicate that 68% of the essential medicines were listed as unrestricted benefits in all the formularies in which they were listed; 5% were listed as restricted benefits; and 27% were listed as a combination of unrestricted and restricted benefits depending on the plan. Overall results for the drug costs indicate that 57% of the essential medicines were listed as unrestricted benefits in all the formularies in which they were listed; 17% were listed as restricted benefits; and 26% were listed as a combination of unrestricted and restricted benefits depending on the plan. Note: Based on the total number of essential medicines (125). *The selection of drugs was based on the CLEAN Meds Project list of essential medicines for primary health care in Canada as of 2016. In terms of the listing decisions across multiple plans, 94% of the essential medicines were listed in 6 or more of the 11 public drug plan formularies, accounting for 99% of the respective drug costs. Table 3.1 provides the ranges of the bilateral agreement rates across the plans analyzed, both in terms of the number of drugs (unweighted) as well as the corresponding costs in the NPDUIS public drug plans (weighted). The results show a high degree of alignment across plans. Canadian Institute for Health Information. 2016. Prescribed Drug Spending in Canada, 2016: A Focus on Public Drug Programs. Ottawa, ON: CIHI. Canadian Health Coalition. 2016. A National Public Drug Plan For All. Ottawa, ON. Morgan S, Hanley G, Raymond C, Blais R. 2009. Breadth, Depth and Agreement among Provincial Formularies in Canada. Healthcare Policy 4(4):162-84. This report compares drugs listed on the formularies of each of the public plans. Depending on the plan design, some specific categories of drugs were covered through specialized programs and, thus, were not included on the formulary. To improve the consistency of comparisons among the public drug plans, these drugs were excluded from the analysis. In addition, over-the-counter drugs and drugs without utilization data in 2015 were excluded from the sample analyzed. Table A1 provides an overview of the excluded drugs along with their share of total drug costs for the NPDUIS public drug plans in 2015. *Includes drug costs for all provincial public drug plans, except Quebec, as well as the NIHB. †Includes, for example, drugs without a brand or generic code in the NPDUIS database. In this analysis, a drug is considered to be a restricted benefit if all available versions (strength, form, and/or manufacturer) listed on a formulary have a restricted benefit status. Conversely a drug is considered to be an unrestricted benefit if at least one version is categorized as unrestricted. While most plans define unrestricted status in the same way, there are various definitions for restricted benefits, and differences in the clinical criteria under which the drug will be funded. Table B1 lists the categories of formulary benefit status as per CIHI's groupings for each plan along with the corresponding definition of restricted or unrestricted formulary benefit status used in this study. Exceptional medications in Quebec were designated as restricted benefits; all remaining drugs listed on the formulary were unrestricted. *The benefit status reported in NPDUIS is as submitted by the jurisdiction. The formulary listing rates in this report are weighted based on the total drug costs in the NPDUIS public drug plans, which do not include data for Quebec. In addition, these rates may be influenced by the drug costs in larger plans and/or the number of plans that reimburse any particular drug: drugs not commonly reimbursed, or reimbursed by smaller plans, may have lower weights in the overall results. To test the extent to which these limitations impact the results, Figure C1 gives the cost-weighted listing rate results from Figure 1.1 using national sales data, which includes public, private and out-of-pocket payers. While the national sales-weighted listing rates are slightly lower, averaging 91% rather than 95%, the results are comparable and do not impact the overall findings of the study. This bar graph gives the unweighted listing rates and cost-weighted listing rates for each public plan analyzed based on national sales. The accompanying table gives the absolute number of drugs listed on each formulary. In total, the 729 drugs selected for the study representing $6,555 million in NPDUIS public drug costs in 2015. Note: Listing rates were based on the total number of drugs (729) selected for the study. Data source: National Prescription Drug Utilization Information System Database, Canadian Institute for Health Information; List of Medications, Régie de l'assurance maladie du Québec, Nov. 20, 2015; Payer Insight Database, January–December 2015, QuintilesIMS Brogan. All rights reserved. The World Health Organization (WHO) defines essential medicines as those that satisfy the priority health care needs of the population and are intended to be available within the context of functioning health systems at all times in adequate amounts, in the appropriate dosage forms, with assured quality and adequate information, and at a price the individual and the community can afford. This report considers a list of 125 essential medicines based on the CLEAN Meds Project for primary care in Canada as of 2016. The CLEAN Meds list was developed by taking the list of essential medicines published by the WHO and adapting it to primary care in Canada through peer review by clinicians and using prescribing patterns in Canada. The specific drugs used for this analysis are listed in Table D1 along with their corresponding drug expenditure in the NPDUIS public plans and national sales. Note: This list of drugs is based on the CLEAN Meds Project list of essential medicines for primary health care in Canada as of 2016 (http://cleanmeds.ca). Some drugs from this list are not included in the list of drugs analyzed in Sections 1 and 2. 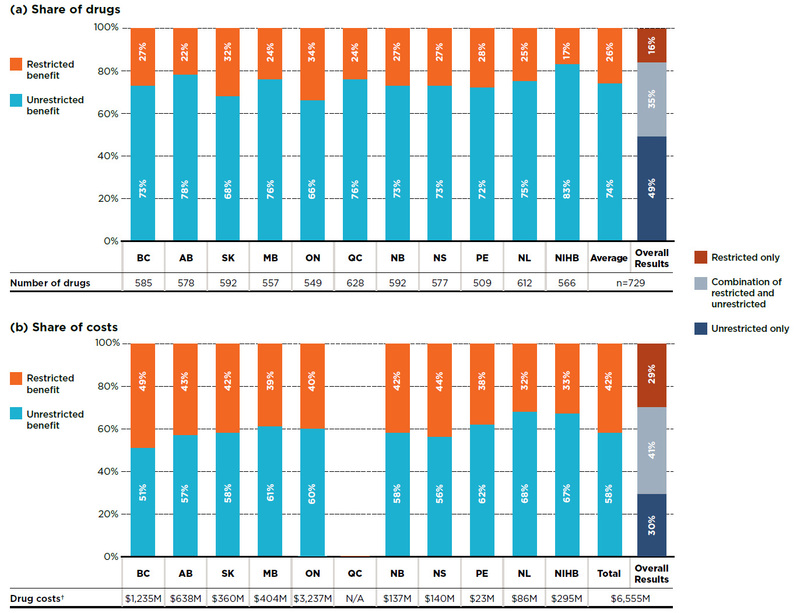 *Total drug costs for all provincial public drug plans (except Quebec) and the Non-Insured Health Benefits (NIHB) Program. ‡Long-acting insulins include insulin glargine and insulin detemir, i.e., those that cover insulin needs for approximately one full day. All remaining insulins are grouped under insulin, others. §This total includes the costs of the drugs that may not be listed on individual public formularies. Data source: National Prescription Drug Utilization Information System Database, Canadian Institute for Health Information for public drug plan costs; QuintilesIMS MIDAS™, 2015 (all rights reserved) for national sales. Due to data limitations, some drugs may be under reported in both data sets. Costs for Quebec were not factored in due to the lack of available data. The CLEAN Meds list can be accessed at: http://cleanmeds.ca. As this is a living list, the drugs included will vary over time. The essential medicines used for this analysis are given in Appendix D.
All pharmacare programs except for Palliative Care, Nursing Homes and other personal care programs (including New Brunswick’s Extra-Mural program) were considered for the analysis. As described by the World Health Organization (WHO), essential medicines are those that satisfy the priority health care needs of the population and are intended to be available within the context of functioning health systems at all times in adequate amounts, in the appropriate dosage forms, with assured quality and adequate information, and at a price the individual and the community can afford. The WHO Model List of Essential Medicines serves as a guide for the development of national and institutional essential medicine lists. The CLEAN Meds list was developed by taking the list of essential medicines published by the WHO and adapting it to primary care in Canada through peer review by clinicians across Canada and using prescribing patterns in Canada. The complete list of drugs, along with their corresponding therapeutic categories, can be accessed online at: http://cleanmeds.ca. A comprehensive summary of the sub-plans available in the NPDUIS database, along with the eligibility criteria, is available in the Reference Documents section of the NPDUIS Analytical Studies page on the PMPRB website. There are some important variations in provincial and territorial delivery of cancer care. While British Columbia, Alberta and Saskatchewan fund all cancer therapies including oral medications, other provinces such as Ontario have different payment sources for cancer drugs depending on the medication and how and where it is delivered. For example, in Ontario, oral cancer drugs and injectable drugs delivered through hospital or cancer centre outpatient pharmacies and community pharmacies are listed on the formulary. A link to the complete list of the drugs included in the analysis is available on the Analytical Studies page of the PMPRB website (see the Formularies in Canada listing under the Report Series category). A previous study by Morgan et al. (2009) used a similar measurement except that only yes-yes decisions were considered as agreement. A link to the complete list of the drugs included in the analysis is available on the Analytical Studies page of the PMPRB website (see the Formularies in Canada listing under Report Series). The 41 selected drugs are a subset of the 80 high-cost drugs reimbursed by the NPDUIS public drug plans in 2015. Of these 80 drugs, 41 met the selection criteria previously described and were included in the analysis. The remaining drugs were excluded from this analysis because they were covered by specialized programs, such as oral cancer treatments, which will be analyzed in Part 3 of the series.